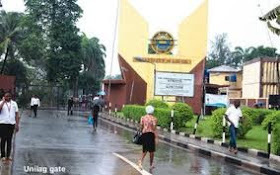 Protesting workers of the University of Lagos on Thursday disrupted activities in the school, as they demanded the payment of their ‘earned allowances’. The workers, comprising members of the Senior Staff Association of Nigerian Universities and the Non Academic Staff Union, blocked the university gate, an action that hindered human and vehicular traffic for almost three hours. The demonstration is coming barely 10 days after the students of the university shut the same gate to protest the electrocution of a third-year Accounting student, Miss Oluchi Anaekwe. But addressing the workers on Thursday, the SSANU Chairman in the school, Mr. Adetomiwa Adekola, said the refusal of the authorities to pay their earned allowances as well as the non-payment of their 13th month allowances from 2007 to 2014 prompted the protest. Adekola added, “The workers unequivocally demand the immediate stoppage of further deductions of contributory pension from the salaries of members of staff, as the contributory pension has been deducted from source before the release of subvention for personnel cost by the Federal Government. The union leader, who wondered why the authorities of the university had failed to pay their allowances, noted that other institutions had been paying the money to their workers. According the university’s Deputy Registrar, Information, Mr. Olagoke Oke, the protest only aims at breaching the peace of the institution. The statement read in part; “Management condemns in totality the action of the two Unions (SSANU & NASU) in shutting the gates of the university, thereby disrupting peace on campus when there has been no declaration of trade dispute.